Concern about affordable medicall care? Florence Dental Medicine can treat you and your entire family and care for your overall oral health. During a routine visit you will have a thorough examination of your mouth (including teeth, gums, and other structures), a professional cleaning, and a discussion about your dental (and overall) health. Cosmetic dentistry is dentistry aimed at creating a positive change to your teeth and to your smile. Today, cosmetic dentistry is more popular than ever, from whitening and shaping to closing spaces and replacing teeth. Florence Dental Medicine provides the most advanced technology in cosmetic and general dentistry. Affordable dental crowns and bridges are procedures to get a healthy, gorgeous smile. There are various types of crowns, ranging from full porcelain to full metal. Call us today to learn more about crowns and bridges and how they can enhance your smile. Invisible braces is also known as clear-aligner treatment, are orthodontic devices that uses incremental transparent aligners to adjust teeth as an alternative to dental braces. Interested in straightening you teeth but afraid of the look of tadditional braces! Invisalign can be a great solution. Dental implants can help you smile more confidently. A dental implant is permanent and is an effective, attractive, secure way to fill gaps in your smile. Dental implants have been life changing for millions of people. Schedule a free consultation and change your life forever. The goal of oral cancer screening is to identify mouth cancer early, when there is a greater chance for a cure. A thorough, systematic examination of the mouth and neck need only take a few minutes and can detect these cancers at an early and curable, stage. Dr. Maia is originally from Lisbon, Portugal. She is a devoted wife and mother of two children. During her free time, she enjoys family time and the outdoors activities. She earned a Bachelor degree in Biology and Clinical Laboratory Sciences from Rutgers University and the University of Medicine and Dentistry of New Jersey. 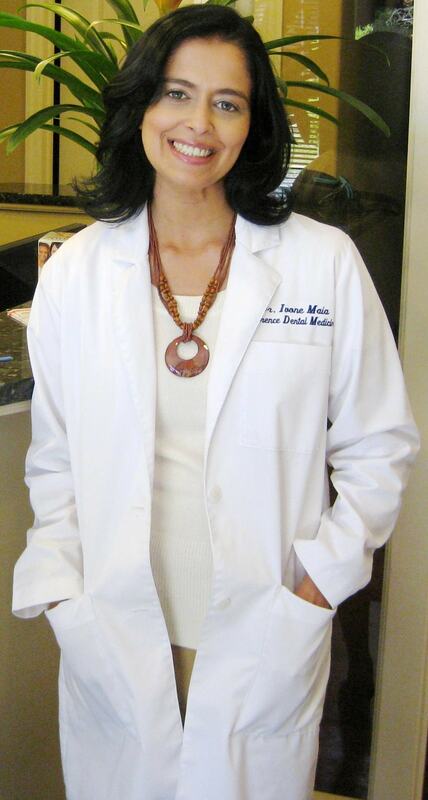 To further her studies, Dr. Maia pursued and earned a Doctorate degree in Dental Medicine from UMDNJ. Her desire and passion for science and medicine lead her to continue and successfully complete a postgraduate degree, where she earned a Masters in Biomedical Sciences. Dr. Maia defended her thesis, which explored the role of inflammatory cytokines such as IL-1 in periodontal disease and resorption of alveolar bone. The study also correlated the effects of triclosan found in local delivery systems to manage periodontal conditions. Dr. Maia continued to further her interest in medicine by specializing in the field of Oral Medicine, where her expertise and extensive training enable her to treat a variety of medically complex conditions that require both medical and dental management of such disorders prior and during dental treatment. Dr. Maia is a longtime member of ADA and the AAOM. Our office is conveniently located on 501 Delaware Ave, Roebling, New Jersey, and is accessible via all major roads (Route 130, 295 and New Jersey Turnpike/Pennsylvania Turnpike Extension). We are proud of our office, which fully utilizes state of the art equipment. We have a modern sterilization system that surpasses OSHA requirements. The source of water for our dental units is distilled water (bottled water), which removes any chance of contamination from regular tap water like that used in most dental offices. We make every effort to provide you with the finest care and the most convenient financial options. To accomplish this we accept most insurance plans, including payment from most PPO and indemnity plans. For your convenience we also provide financing through Care Credit. Care Credit works similarly to a credit card offering free financing. Please call our office to make an appointment and to ask any questions you may have. We deliver the finest care at the most reasonable cost to our patients, therefore payment is due at the time service is rendered unless other arrangements have been made in advance. For our patients' convenience we accept all major credit cards, cash, and personal checks, and if necessary can personalize a payment plan, which helps our patients receive their treatment in a timely manner. Florence Dental Medicine. Copyright © 2018. All Rights Reserved.